People with hidden disabilities could enjoy new freedom with blue badge changes. Consultation expanding the Blue Badge criteria released. People with hidden disabilities could soon have greater access to blue badges under new plans from Transport Minister Jesse Norman today (21 January 2018). The proposals, which would herald the most significant changes since the blue badge was introduced in 1970, would help remove barriers to travel for people with conditions such as dementia and autism, allowing them better access to work, shops and amenities. This is part of the drive for greater parity between the treatment of physical and mental health conditions. Currently, about 2.4 million disabled people in England have a blue badge, allowing them to park on roads without charge and normally without time limit. Around 75% of blue badge holders say they would go out less often if they didn’t have one. Blue badges give people with disabilities the freedom to get jobs, see friends or go to the shops with as much ease as possible. We want to try to extend this to people with invisible disabilities, so they can enjoy the freedom to get out and about, where and when they want. The changes could also see a variety of healthcare professionals, who are better placed to identify if mental health causes mobility issues, carry out assessments to determine if a blue badge should be given. The National Autistic Society welcomes this government proposal. It could mean that many more autistic people will qualify for a Blue Badge, which can be a lifeline. There are an estimated 700,000 autistic people in the UK and whilst every person on the autism spectrum is different, for some, not being able to park in a predictable place close to a destination can cause a great deal of anxiety and put their safety at risk. Some autistic people can experience too much information from the environment around them on public transport, while other autistic people might not be aware of dangers on the road. However, current Blue Badge rules mean that all-too-often autistic people don’t qualify. The National Autistic Society has raised this issue with government over recent years and we are pleased to see they have listened to the concerns of autistic people and their families. We hope the government will make this important change and we look forward to working with them to make sure that autistic people and their families benefit. This entry was posted in Benefits, epilepsy, news and tagged autism, Blue Badge, Consultation, disabilities, Driving, epilepsy, Government, mental health on February 9, 2018 by Sam Downie. Now that the transfer from DLA to PIP is pretty much a done deal, with a few more tweaks likely – but otherwise leaving up to half a million of us with Epilepsy and other Disability’s out in the cold with a loss of vital benefits. It’s not rocket science to see that many of those who will lose out are going to have to make stark choices about food or heating, not buying essential equipment or important extras not available on prescription, or having to forgo the motability car they were saving for. But there are other, unforeseen, side effects of this hateful, unwanted legislation. People who are removed from DLA and fail to make the transfer to PIP because they won’t clock up enough points on the tick-box assessment won’t just lose the money – they will also lose their eligibility for passport benefits. Passport benefits are extra benefits you can only access if you are already receiving DLA. The most well known ones are the Disabled Rail Card and the Concessionary Disabled Bus Pass issued by local authorities (LA). It’s going to be a massive huge blow to wheelchair users who use accessible buses and trains, as well as those with limited mobility on foot who need access to public transport. And – People with Epilepsy will also lose out heavily because they are the main group among disabled people who are not medically fit to drive. Many people with far more disabling conditions can still drive themselves in adapted vehicles and can go pretty much anywhere they please. People with uncontrolled epilepsy are completely dependent on public transport and taxis. Over the past 24hrs, I had a good look at the PIP points, which you can READ ABOUT HERE. Looking at the PIP points allocation, I’m fairly sure I won’t qualify for PIP even though I have a lifetime award for DLA. I get DLA because preparing and cooking a meal unaided is very risky for me, likewise going out unsupervised ‘sometimes’ is also risky because of the possibility of having a seizure while crossing the road, for example. These are the risks to health and safety we need to consider everyday, as people with Epilepsy and other neurological conditions. These are just some of the conditions why we qualify for travel concessions. However, concessionary bus passes in England and Wales are issued by local authorities and it’s quite literally a postcode lottery, as LAs can set their own criteria for eligibility. Most require proof that applicants receive DLA, such as a copy of the award letter. For disabled people living in those local authority areas, the loss of the bus pass will be a bitter blow. It will certainly severely limit my ability to get around as much as I’d like to, yes – even to work! And by this… Disabled people will suffer severe isolation at home. Likewise, eligibility criteria for the Disabled Rail Card, which gives a third off rail travel for the holder and a travel companion, vary depending on the type of disability but again most categories require proof of receipt of DLA. Loss of access to the trains and buses (and also the Tube, trams and local area trains on the bus pass in London) will seriously hinder disabled people’s ability to get around – to go to work, to socialise, even to get to the shops – and participate fully in society. And of course, loss of disability benefits means people will have no spare cash to pay for expensive taxis instead. Before I moved house, I worked out I was spending most of my monthly DLA on Coaches to London, local Buses (when on on-peak hours), and taxis at night – because it was too dangerous to walk home from the centre of Bristol in the evenings (it’s a 4 mile walk home from Bristol City Centre for me). For many people loss of access to cheap or free travel could be even worse than the loss of the cash benefit itself. Have a read of this > http://www.benefitsandwork.co.uk/news/latest-news/1512-pip-losers-revealed < also ! This entry was posted in Benefits, Department For Work And Pensions, epilepsy, news on December 14, 2012 by Sam Downie. 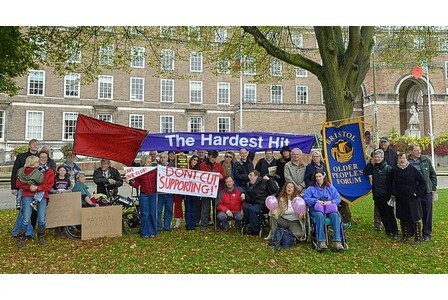 On Thursday 25th October, a peaceful #HardestHit protest took place during lunchtime, organised by the Bristol Disability Equality Forum , held outside the Council House in Bristol, UK – yesterday (Thursday 25th Oct 2012). 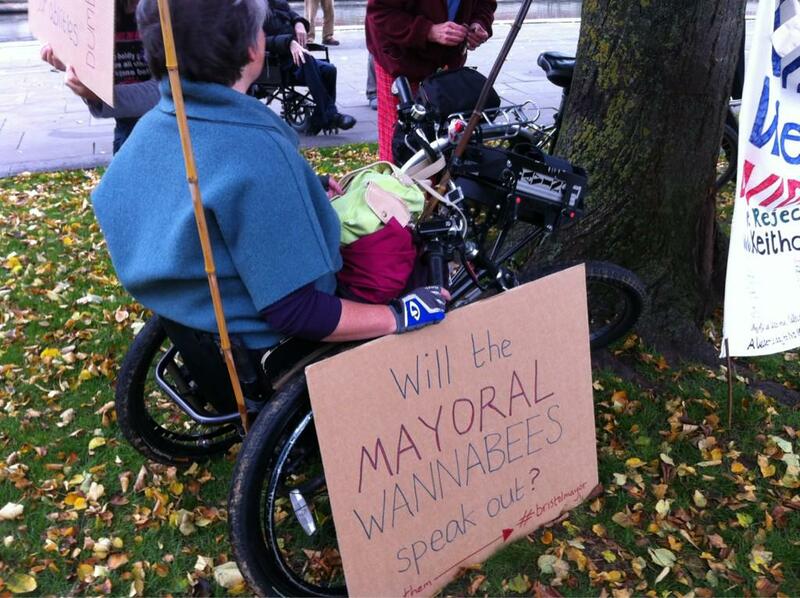 But – a few disruptive things took place, and one of these was picked up by the local press (The Post) who posted this story today “A Disability campaigner spat at #bristolmayor #LibDem candidate Jon Rogers”. 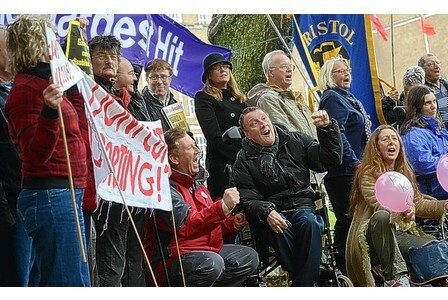 And of course, a row broke out between Jon and other people with Disability’s, during this peaceful protest held in Bristol, campaigning against the cuts to Welfare, and employment. As usual, the token ‘anarchist’, who has their own agenda, gets all the publicity from the media, as well as giving free publicity to two of the mayoral candidates, while the actual reason for the demonstration (i.e. disabled people’s fears of the cuts hitting them) gets a little bit at the end of the report. A report by the Children’s Society and Disability Rights UK claims 230,000 severely disabled people are set to get between £28 and £58 less in benefits every week, while 100,000 children stand to lose up to £28 a week. Also – up to 116,000 disabled people whoWORK , will be at risk of losing £40 a week (which helps with costs such as Travel and Work Place adaptions, that employers do not provide! MAYORAL candidate Jon Rogers was spat at by a demonstrator when he attended a protest over cuts to benefits for disabled people. A man campaigning on behalf of a rival candidate also threw his cigarette at the Liberal Democrat hopeful, who is the city council deputy leader. 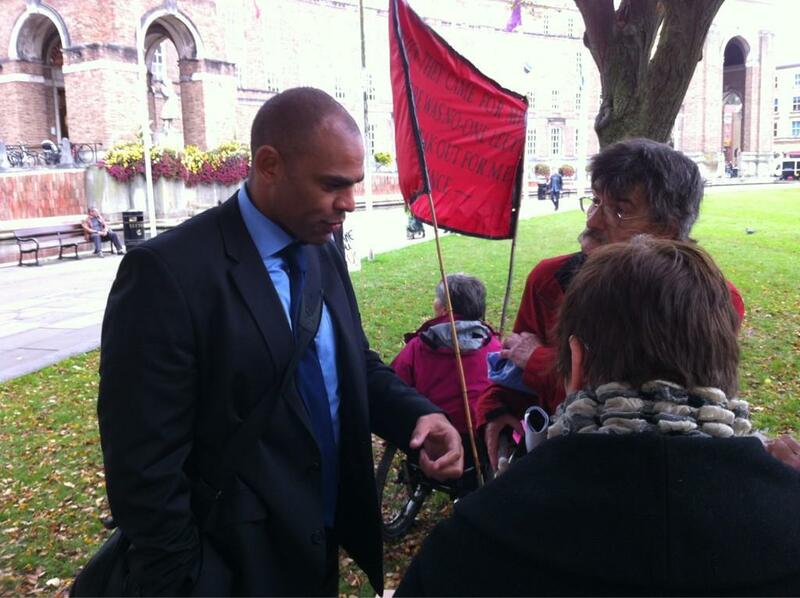 Jon Rogers said “he was appalled at what happened and said he believed the actions constituted “assault”.” The campaigner who spat at Jon Rogers, ‘Michael Wright’, attempted to justify his actions by claiming Jon Rogers had “no place” at the march because of Bristol City’s Council’s planned closures of care homes for Disabled and the Elderly. The activist, who is campaigning for Trade Union and Socialist Coalition mayoral candidate Tom Baldwin, told The Post: “I don’t think he has much of a place at a demonstration like this. He has closed operations for eight care homes in Bristol.”. After Jon Rogers walked away from the fracas he said: “I have come down here to offer myself up to talk about disability issues, not to be abused in an appalling way. It’s assault.” But Jon Rogers said he did not intend to take the matter further. As I was attending this peaceful ‘Hardest Hit’ protest, I’d thought I would share with you. Read to see what really went on and what I observed over the space of Lunchtime. Around 20 minutes into this peaceful protest, Jon Rogers came by on his bike, wanting to know what was taking place. He did start to talk to various people, including me and yes he did listen to concerns. Whilst I was talking to other people, I heard a argument row taking place, between Jon and someone who I didn’t know, someone who I’d thought had just ‘shown up’. So I walked over to where the row was taking place, and listened for a short while. No I didn’t see Jon being spat at. No I didn’t see a cigarette flung at him. But – I did hear Jon say (during the argument taking place) “I don’t support people like you, and I don’t think you all need to be here”. Was this a dig at the person who spat at Jon, or was this a general thought/saying of his to everyone who was there (me included) ? (if that’s the case then that could be called ‘indirect disability discrimination’). thanks both for speaking to me and coming to see what was going on and learning more about the Hardest Hit welfare cuts. 2. Why Was I There ? Simple. I work. I have a Disability, and I claim Benefits (DLA and Working Tax Credits) which help me to stay in WORK. I’m a self-employed Journalist (freelance for BBC News, freelance for The Guardian, freelance for Channel 4 + other technology magazines and websites). I’m also a Presenter / broadcaster. More information about me at my website :http://www.dsoundz.co.ukAnd as a Broadcaster/Journalist, these Welfare cuts will effect me, and my work. Why? well perhaps I can answer it like this: Why do I need to claim Benefits? 3. What’s my Disability ? It’s simple again. I have 3 forms of Epilepsy. (read more about me and Epilepsy here : http://www.dsoundz.co.uk/sam-and-epilepsy ). Epilepsy effects over half a million people in the UK, and over 50 million people worldwide. I am banned from Driving (it’s against the law to drive with Epilepsy, where ever you are in the world), so need help with costs for getting to / and back from work. My seizures effect the way I work too, as Epilepsy effects Memory and body control. The AED’s (anti-epilepsy drugs) I take, don’t cure Epilepsy… as, there is no cure for Epilepsy… fact!All AEDs help by dampening the effects of seizures. And I take quite a bit of drugs per day to help combat seizures, but like all drugs, there are side-effects. When you look at me. Ask yourself this: Can you see me having a seizure? (I have over 10 of these a day!). Epilepsy is a ‘hidden disability’, as it’s within the brain. So the next time you see me, do ask me How am I, and ask about what Epilepsy is and how it effects me and my work. 4. What to do next ? Carry on sending out the message that Welfare cuts, will hit everyone – in employment (or not). What I am doing right now is… talking to MP’s and various Lords in the HoC, by helping them with research. I’m also doing some research for the ‘POST’ office (that is the Parliamentary Office for Science and Technology) a government body who discuss research and analysis in all kinds of things, but more recently they have held discussions and posted documents about Welfare benefits looking at things such as IT (technology) and how people with various impairments might not be able to use these new services being introduced by the DWP (department for work and pensions). I’m also looking into the Data Protection Act and how Fraud is rife within the DWP and it’s Work Programme (but I’ll blog about this at another time). So before you come to the conclusion that people with Disability’s, do not work / or are benefit scroungers. Do think again ! and make sure you know yourself what the right thing to say is. Working people like me, ARE tax payers. We pay rent too. This is why I protest against the Welfare cuts, as it effects employment and a chance in a working life. A Disability is for life…. fact ! Disability, effects everything around you, and sometimes there’s a small chance of a cure. There isn’t one right now for the over 50 million people worldwide who suffer daily with Seizures and Epilepsy. 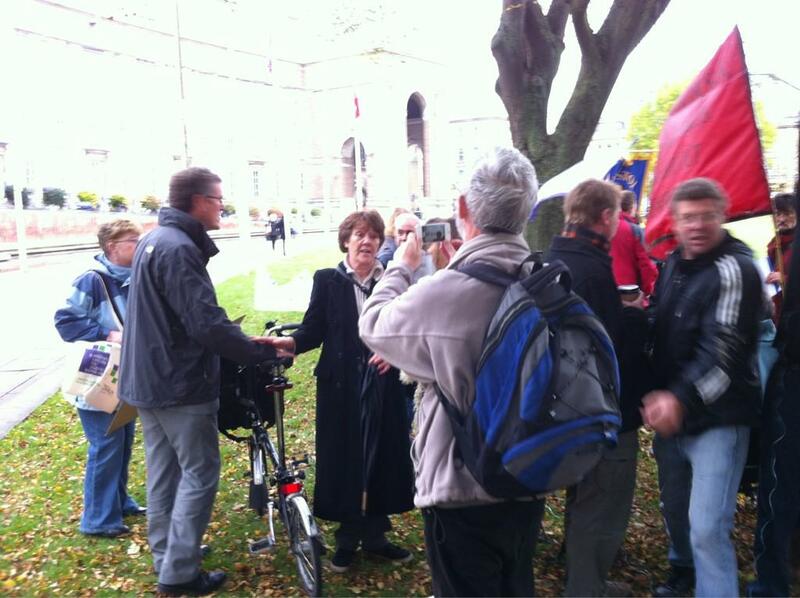 So now you can see why I was there at the Hardest Hit protest in Bristol, on Thursday 25th October 2012. This entry was posted in Action, Benefits, Campaigns, Department For Work And Pensions, events, Health, news and tagged Bristol, bristol city council, bristolmayor, campaigner, college green, consultant, council house, data protection, disability, epilepsy, fraud, gp, groups, hardesthit, jon rogers, nhs, peaceful, people, protest, protests, rally, row, sam downie on October 30, 2012 by Sam Downie. Epilepsy Society is urging newly appointed Government contractors to consider the needs of people with epilepsy when reassessing their disability benefits. The charity is part of the Disability Benefits Consortium which is encouraging the contractors to sign up to 10 pledgeswhich they believe will deliver a fair deal for those with a disability. The Government has awarded a contract worth hundreds of millions of pounds to two private sector companies, ATOS and Capita, to reassess disabled people for a disability benefit – Personal Independence Payment or PIP. This is designed to help with the essential higher costs of living. ATOS already conducts face to face assessments for people accessing Employment and Support Allowance (the benefit for disabled people out of work), but continues to draw intense criticism due to the high rate of inaccurate decisions, successful appeal rates (40%) and waste of restricted resources. Appeals to ESA decisions cost over £26 million in 2010/11. The Disability Benefits Consortium is concerned that many disabled people will be stressed and fearful of the new process – as well as mistrustful given the overarching aim of reducing expenditure. DWP plans show that 500,000 fewer disabled people will be eligible for support. The consortium is calling on ATOS and Capita to learn lessons from the Work Capability Assessment, used to assess people for ESA since 2008, and sign up to 10 pledges that will help alleviate concerns, establish a greater trust in the new system and deliver a process that is as fair as possible under Government plans..
PIP is being introduced as the Government abolishes Disability Living Allowance (DLA) which was introduced from 1992 to help disabled people with essential higher living costs. The change affects working age disabled people (16-64 years of age) from April 2013 . Disability Benefits Consortium 10 pledges. Disability Benefits Consortium (opens in a new window). This entry was posted in Action, Benefits, Campaigns, Department For Work And Pensions, epilepsy and tagged ATOS, benefits, department for work and pensions, dla, dwp, epilepsy, pip on October 16, 2012 by Sam Downie.